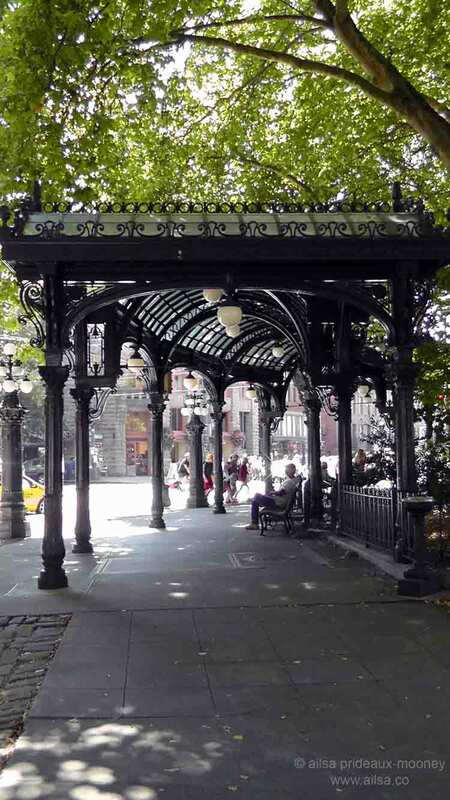 The Endangered Pergola of Pioneer Square | Where's my backpack? I’ve spent a fair bit of time exploring oddities in the Ballard, Fremont and Georgetown neighbourhoods of Seattle, but apart from the neon library and the Gum Wall, I haven’t shown you much of downtown Seattle yet. So here is one of my favourite downtown features, right in the heart of Pioneer Square. The pergola, boasting 65,000 pounds of iron, was erected in 1909 as a shelter for a stop on the Yesler and James Street Cable Car Company. Underneath the pergola lay a so-called ‘comfort station’ that was so resplendent it became known as the finest underground restroom in the United States. Locals nicknamed it Queen Mary of the Johns because of the elegant marble stalls, white-tiled walls, terrazzo floor and gleaming brass fixtures. Unfortunately, the restrooms are not accessible today; they were closed to the public shortly after World War II, allegedly due to illicit activities. The pergola’s canopy is an elegant affair of wrought iron and glass held up by cast iron Corinthian columns and in 1977 it was declared a national landmark. It remains one of the most beautiful and most beloved landmarks in downtown Seattle. 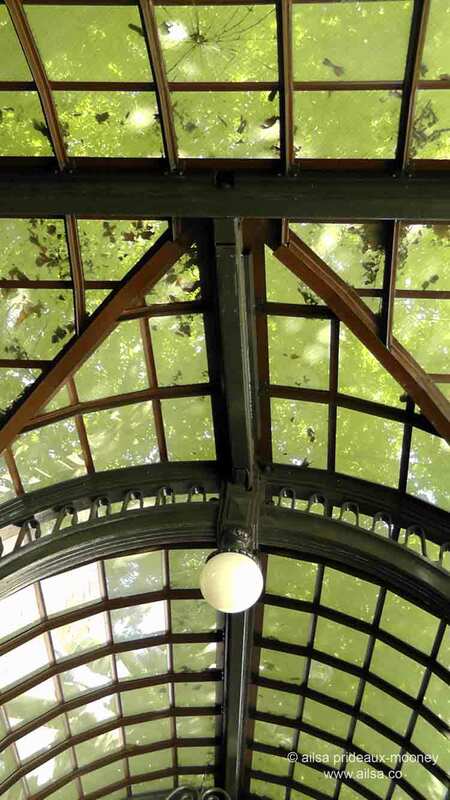 Every time I walk under the gentle arches I glance up at the occasional pane of cracked glass and remember how lucky Seattle is to have the pergola at all, after what happened in 2001. On January 15th of that year, at 5:45 in the morning, an eighteen-wheeler semi truck came trundling down Yesler Way and hung a right onto First Avenue. The rookie driver at the wheel, lost and trying to find his way back to Highway 99, misjudged the turn and took the pergola with him, reducing it to a collapsed heap of mangled iron and shattered glass. 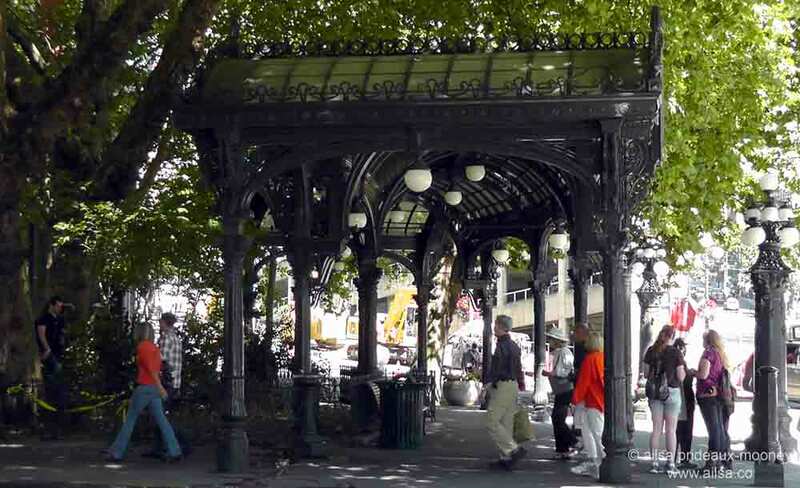 U.S. Xpress Enterprises of Chattanooga, TN, who owned the truck, agreed to pay for the restoration of Seattle’s precious pergola. A local company, Seidelhuber Iron and Bronze Works, had worked on restoring the pergola in 1972 and now took on the mammoth task of rebuilding it. They retrieved every gnarled and twisted piece of iron they could salvage from the pile of pergola, which had exploded so dramatically that pieces of iron were found in bushes over 60 feet away. Remarkably, they managed to find and salvage 99 percent of the original metal, welding it back together. Only one percent of the structure had to be recast. The hard part was putting it all back together again, because there were no blueprints. Instead, they spent nineteen months working off old photos and drawings, trying to figure out the correct dimensions. As a safeguard against any future mishaps, the structure was reinforced with a skeletal foundation of 50,000 pounds of steel. $3.9 million dollars later the pergola was ready and on August 17th 2002 it rose like a phoenix from the ashes and resumed its position at the corner of First and Yesler and there it has remained ever since. The pergola has, however, weathered many perils since its resurrection. In September 2008, in a re-enactment of the 2001 incident, a semi turning from Yesler Way onto First took out a protective bollard on the corner and grazed the pergola. In April 2012 yet another semi taking the same turn clipped the pergola and damaged the roof, shearing off the protective bollard that had now been bolted to the sidewalk. A new protective bollard, anchored into the restroom below the pergola, was put in place. In May of last year, another semi ran over the bollard which this time refused to budge. Instead, the truck went up and over, got high-centred on the bollard, hit the canopy, and ended up wedged against the pergola. Two months later, in July, a pickup truck hopped the sidewalk and slammed into one of the historic lamp posts that make up the pergola complex. The future seems fraught with danger for the poor pergola. 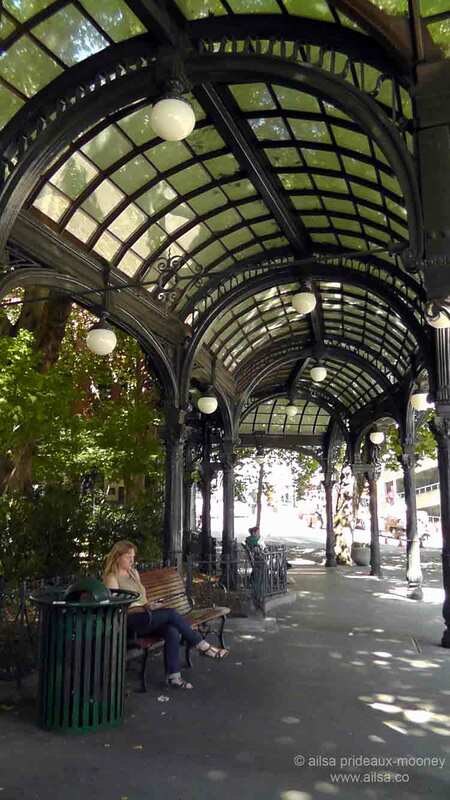 Next time you’re in Seattle, put aside some time to visit Pioneer Square and admire the pergola…while you still can. And if you’re driving, please, please, please take it easy at the corner of First and Yesler. This entry was posted in Photography, Travel, United States, Washington and tagged architecture, history, humor, photography, seattle, travel, writing. Bookmark the permalink. Poor pergola has been through a lot! I imagined the reconstruction to be a giant iron jigsaw puzzle. Interesting post Ailsa. Seems like it is a magnet! Fingers crossed for improved driving skills in Seattle. What an interesting history and lovely structure. Thanks for this Seattle flag, I plan to check it out when there. When I am, I ‘ll keep an eye out for semis…. Time for some driver training? Or speed restrictions and massive warning signs…at the end of the day, what can you do? Great gallery – not fare of mine … of the Pioneer Sq – very nice area to spend some time at – change so much since I sailed out there … twice per day – in 1989. Very trendy today. I was there 2 years ago – and I couldn’t see any cracks as you have captured, but I’m sure they were there. I hope they will look after it. This was really a fun post to read. You write so well. Goodness, this pergola attracts accidents! Maybe the road is just too narrow for tractor trailers? The pergola is exceptionally beautiful, so glad the City decided to rebuild it as a unique treasure. It is so firmly entrenched in the hearts of Seattleites they simply had to rebuild it. The project won an award for Outstanding Achievement in Historic Preservation. Great story about the pergola! Wonderful post, Ailsa. A life of its own indeed. It looks so Parisian. I’ve been in Pioneer Square so many times and never noticed it. . . might have walked under it without knowing. It’s beautiful and has as many lives as a cat! Great post! You have done an excellent outline of the multiple-incident Perils of the Pergola. Interesting story of this pergola – and I’m glad they rebuilt it. It’s a beauty. What a beautiful piece of history! Would someone please create a diversion route for trucks??? Its always nice to see a fresh take on this lovely structure. It was one of the reasons I wanted to be an architect. I’m not, but its still amazing. Thank you for the lovely images and nice memories. I’ve only visited Seattle once, very briefly. I missed this, but if I’m there on a hot summer day (do those exist in Seattle?) this is where I’d want to be. I’ll be heading out there soon again. will have to check it out! The pergola sounds like a magnetic attraction for semis and pedestrians alike – sorry I couldn’t resist – what an incredible story and great pictures! Love this!…shared on my personal facebook page. Yeah, I came here looking for more information about the Pergola. Man, what horrible timing.